No shows / late arrivals with no contact from guests will be cancelled and charged for the first 2 nights of the booking. We require 3 days advance notice for cancellations/ modifications of group reservations. Our hostel is warm and cozy, located just a 5 min walk from central Bariloche. We have 7 rooms including 3 double rooms, 2 private rooms for 1 or 2 people and a 6 bed dormitory. Breakfast is included and consists of juice, fresh coffee, cereal, and freshly baked homemade scones. The hostel boasts a complete kitchen for guests´ use, we have a large comfortable communial area. We offer 24 hour free Wifi to all our guests during their stay. 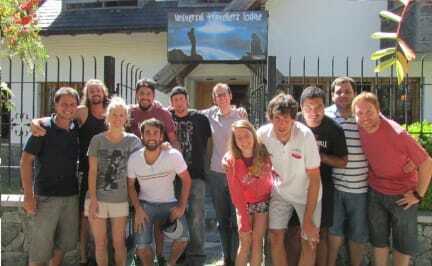 We also offer advice and special offers for many excursions and activies in Bariloche. Just ask our friendly staff! Don’t forget to try our relaxing heated pool and local beer on tap during your stay. Perfect for unwinding after a day hiking or on the slopes! ** Please make certain to check the price of the room in US Dollars, this is the price of the room, payable in Dollars, Euros or Argentinan Pesos, with the exchange rate taken on the day of arrival.